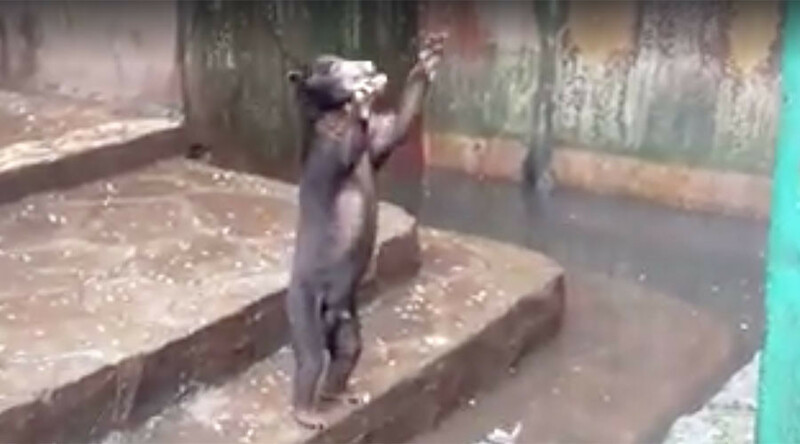 A horrific video has emerged of emaciated sun bears begging for food at Bandung Zoo in Indonesia. A petition calling for the zoo's closure has garnered almost a quarter of million signatures. The disturbing images show two bears begging for food from tourists as onlookers throw junk food to the animals in a macabre display. The unfortunate creatures are kept in a grim enclosure surrounded by murky water and no obvious signs of food. The so-called zoo, which is located in the city of Bandung on the Indonesian island of Java, has been termed the ‘death zoo’ and has been the subject of a number scandals in the past that have seen animals at the zoo die unnecessarily. As a result of the poor conditions at the zoo, a Change.org petition calling on President Joko Widodo to immediately shut the zoo has amassed over 240,000 signatures. The video of the skeletal bears begging for food is sickening. Nothing aggravates me more than a roadside zoo caging helpless animals. Makes my heart break seeing those poor bears begging for food in that awful zoo😭😭 why capture them if u can't look after them ?!? “We saw a sun bear eating its own dung but when we contacted the zoo's officers they told us the bear was medicated and we weren't allowed to see it,” Gea said. Sun bears are native to Indonesia and other South Asian countries, and are also known as the honey bear for its love of honey. They are the smallest, least well-known and one of the rarest of all the bear species.